The Bay Area on Saturday morning and afternoon experienced a brief break from widespread soggy and blustery conditions, but a third system arrived by the evening hours. The latest storm, which is expected to batter the region beginning late Saturday, has triggered a number of serious weather warnings, including a flood warning for Solano and Santa Clara counties. 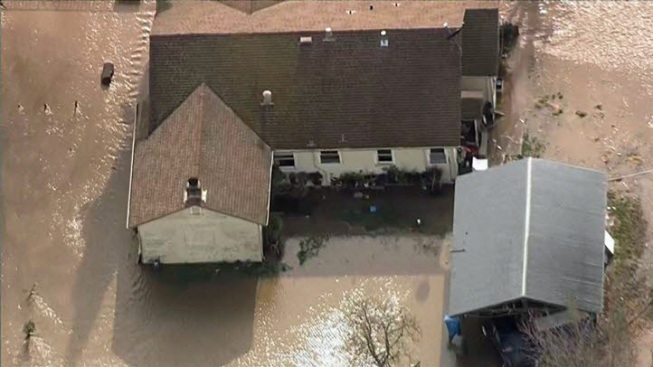 Residents in Hollister are bracing for the worst after a broken levee on Friday flooded several roads, homes and farms. With rain in the forecast, folks are being told to stay alert and prepare for possible evacuations. Flash flood watches across the Bay Area will go into effect late Saturday before expiring on Sunday. The areas that could see the highest amount of rainfall include the North Bay and the Santa Cruz Mountains. High wind warnings have also been implemented across nearly every Bay Area county. High winds on Saturday night and early Sunday could fluctuate anywhere from 30 to 50 mph. Gusts could peak near 60 mph. Folks along the California Coast are also being alerted to a high surf warning. Large breaking waves reaching 25 to 30 feet on Saturday are expected to pound shorelines from Sonoma to Monterey counties. The high surf warning is scheduled to expire at 3 p.m. on Sunday.